Xero runs on a cloud platform where the data remains on server of Xero and you can login to the accounting platform just like you login to your email ID on Gmail or Yahoo. Having your data on Cloud gives you an ease of access and you can login to your accounts from anywhere. You just need a reliable internet connection. 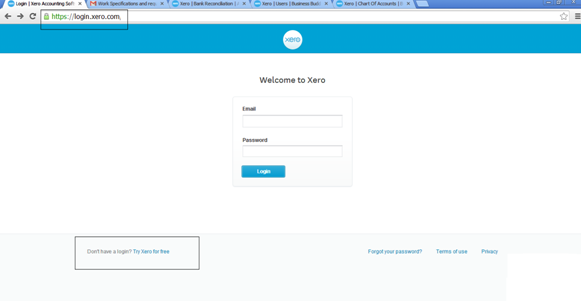 You can use any of your favorite internet browsers to login to Xero. Don’t have a Xero Account? You can try it for free with a 30 days free trial offer provided by Xero. It is your key to business reports you require to see at a glance. You can adjust the things you wish to see on your dashboard. You can see a Quick view of bank account balance and graphs showing money coming in from customer invoices and money due to go out for supplier invoices. It can be customized on the go as per your reporting requirements. Xero has an easy to use menu which helps you to quick jump to various sections where you need to work. We shall explain each menu in later sections.